Bracciano is a town in the province of Rome, about 1 hour drive from Capena. The town is standing on a hill, above the clear waters of the homonymous lake, of volcanic origin, in which you can dip to cool off in the hot summer days, and where you can practice scuba diving, canoeing and many other water sports. One of the most interesting tourist points in town is the medieval Castello Orsini-Odescalchi that still the Castle preserves most of the ancient furnishings and an interesting museum hosting important collections of weapons and medieval armors. The historic center around the Castello, is rich in churches and historic buildings and wandering along the characteristics medieval narrow streets you’ll find yourselves immersed in history. Not to be missed: the stunning views of the lake and the surrounding countryside from the Belvedere della Sentinella or from the Church of Santa Maria del Riposo. A short distance from the historic center, on the banks of the lake, is the Museum Storico of the Italian Air Force in what was some time ago an important experimental center. The big hangar now hosts a collection of airplanes, equipments and a lot of material concerning the Italian aeronautics. 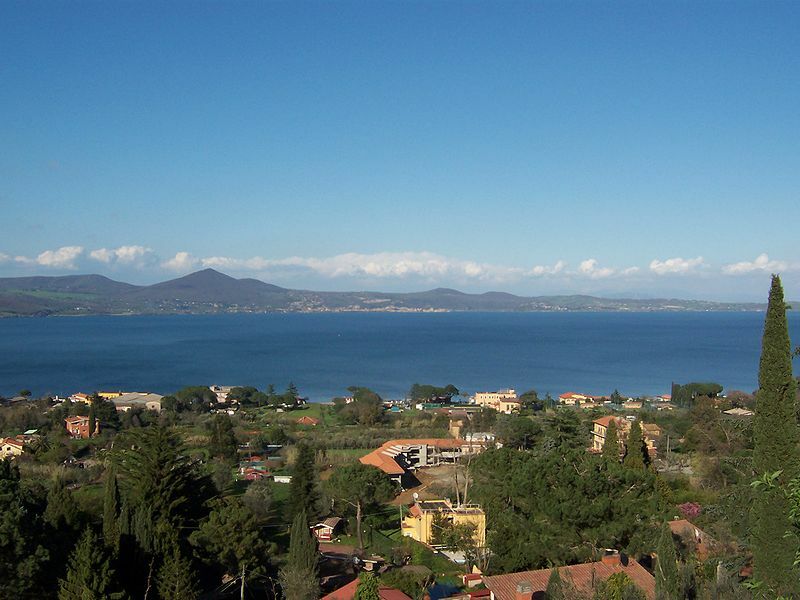 Lake Bracciano is located within the Natural Park of Bracciano and Martignano, so there are strict limits to navigation and very few motor boats are allowed, which makes it an ideal place for water sports. The park also includes Lake Martignano, also of volcanic origin characterized by a small size and an almost perfectly circular shape. Lake Bracciano and Martignano are considered to be “brothers” as generated from the same volcano, except for the fact that Lake Martignano arises from the main crater and Lake Bracciano from a secondary one . Both lakes are well protected and attracts a large number of tourists every year. The area around has also good spots for hiking and cycling. Two important annual events, deeply rooted in the history of the country and region are taking place in Bracciano: the theatrical show of the Passion of Christ involving a parade through the streets of the village that has been held in town for almost 40 years, and the Corpus Domini Flower Festival which, since 1983, shows the skill of Master Florists of Bracciano and involves a large number of worshipers and visitors from all over Italy. Bracciano and its lake make the ideal destination for a day out in the quiet of a natural setting surrounded by history.